Even though we had just seen the Killers perform at Coachella the month previous and I already had a copy of the debut album that this in-store performance was promoting, a friend and I couldn't pass up spending a balmy summer evening on the Sunset Strip. This night marked the first time (of many to follow) that I almost got run over by Angelyne in her pink Corvette, and was one of the few in-stores I had attended in my entire life. I love free shows, but I really don't like standing in line. 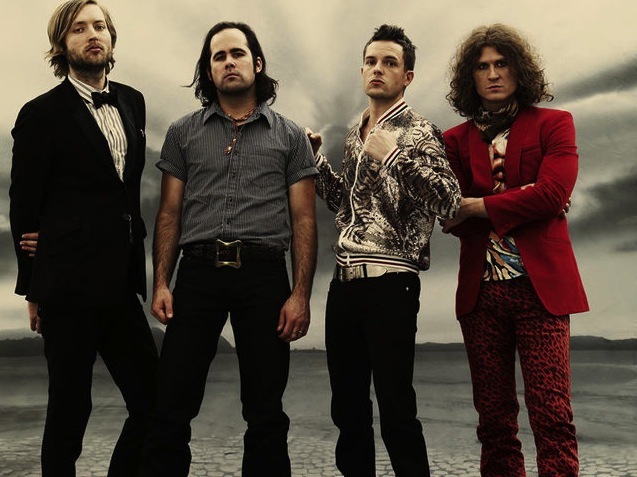 Hot Fuss, "Somebody Told Me" and "Mr. Brightside," and had just toured with Morrissey and stellastarr*, so there was a big crowd on hand to celebrate that day's release of the album. Their May 2, 2004 performance at Coachella won me over with the addition of a gospel choir during "All These Things That I've Done," and I had just interviewed frontman Brandon Flowers for my very first cover story, which was to hit stands the following week, so I was definitely eager to shake their hands and see them play in a more intimate space. Hot Fuss was one of those albums that I knew was going to be a hit the first time I heard it. Chock full of synth-driven tracks – the initial singles, "On Top" and "Smile Like You Mean It" – the album hearkened back to the New Wave era, yet more rock-driven influences like U2, Lou Reed and Smashing Pumpkins could also be heard. It was just the right mix to strike a chord with mainstream radio listeners at this point in time. While Flowers' stage presence was undeniable, Ronnie Vannucci, Jr.'s energy on drums was palpable and guitarist Dave Keuning and bassist Mark Stoermer nonchalantly strummed their respective instruments with a too-cool flair, it was clear that their stage show was better suited to an open-air venue, like that of a Coachella tent, more than a record store, even a legendary one like the Sunset Strip Tower Records. Even so, the Killers will always hold a special place in my heart for the fact that they were my first cover story ever, and Hot Fuss went on to sell over 7 million copies worldwide.